SVECS CheckIns XLS spreadsheet to track totals when doing SVECS net. Updated 6-13-18 (originally created by John Nourse AI6EH). SVECS Quarterly Breakfasts are on the fourth Saturday of January, April, July, and October. That would be Jan 26, Apr 27, July 27, and Oct 26 in 2019. Ive updated this presentation with more emphasis on emergency communications planning and execution that went badly wrong and some suggestions on how to help reduce loss of life in other communities equally at risk for disasters on this scale. 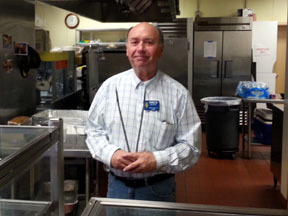 Working in Paradise and Magalia made me realize that a disaster just like the Camp Fire could happen anywhere in the Sierra Foothills. It could happen anywhere in California. The door prize and breakfast prices needed to be adjusted to conform to our budget. The door prize will be $100 and the breakfast cost will be $6. I hope this will not inconvenience anyone. We need to know how many attendees to plan for, so please RSVP on your city nets or to wa6qys aol.com or 408-241-7999. People giving city counts can also give number of breakfast counts) on the SVECS net (AA6BT, 146.115+ 100PL) Tuesdays 2000 hours. Door prizes: $100 gift certificate. Donations for the raffle table are graciously accepted. Please bring your gently used surplus items. Image shows Glen Jr. K6GNG, Chief Cook, of SVECS. These famed American Legion Post 380 J-pole antennas are regarded as highly effective antennas for ARES/RACES base stations, fixed and field use. VSWR is virtually 1.000 and very cost effective for a donation of $30. 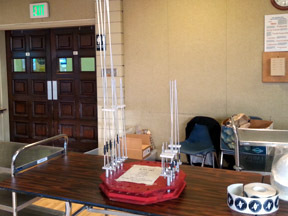 Photos of J-pole antennas for sale. 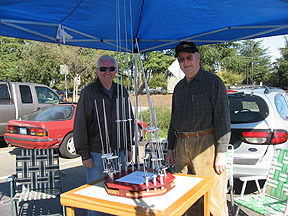 Antennas are available for 2-meter VHF, 220 MHz, and 440MHz. 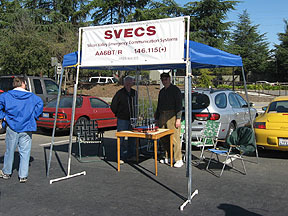 Many thanks to Hee So, N6XVK, for setting up the domain and initial webhosting for svecs.net. SVECS AA6BT Repeater old callsign was WB6ADZ (was changed early in 2003). N6NAC (440 repeater) old callsign was WB6FIY (was changed in mid 2003).